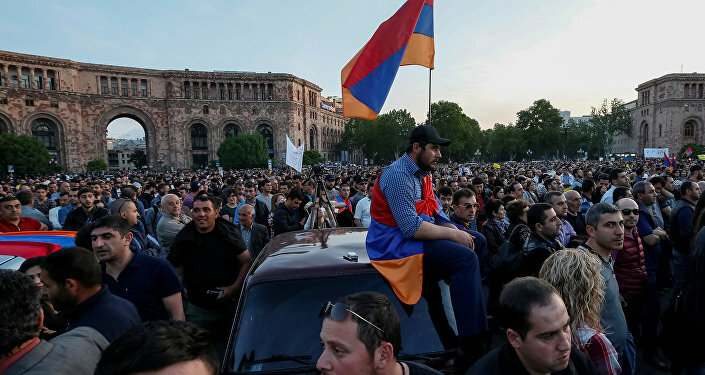 YEREVAN (Sputnik) - A new wave of anti-government protests is taking place in the Armenian capital amid the large-scale political crisis. The demonstrators have already blocked the passage to the central Republic Square, a Sputnik correspondent reported on Sunday. The protesters, mainly students, plan to march toward several universities and wrap up the demonstration at the France Square, where opposition leader Nikol Pashinyan will address them in the evening. The column of students is convoyed by the police and the situation is calm. The rally at the Republic Square is set to begin at 18:00 local time [14:00 GMT]. Demonstrators have blocked the roadways of the main streets in the center of Yerevan, a Sputnik correspondent reports. At every crossing there are several dozen protesters, who sit on pedestrian crossings. Some motorists also joined the protesters, blocking roads with their cars. In some streets, people hinder traffic with garbage cans. The sidewalks are not blocked; people can move freely around the Armenian capital. According to the correspondent, the protesters are in good spirits; they sing songs and chant slogans, criticizing the ruling party. Many participants of the protest hold the Armenian national flag. The police are monitoring the situation, but do not intervene, as the situation in the center of Yerevan is generally calm. A political crisis in Armenia broke out earlier in April after ex-President Serzh Sargsyan was nominated as prime minister. This has been largely regarded as Sargsyan's attempt to stay in power following two terms since the newly amended constitution transferred some of the presidential powers to the head of government. On Monday, Sargsyan resigned amid anti-government protests. Armenian First Deputy Prime Minister Karen Karapetyan became acting prime minister. Rallies continued as the opposition demands a new interim prime minister who is not from the ruling party.